A sign for Toronto's York University is seen in this undated file photo. 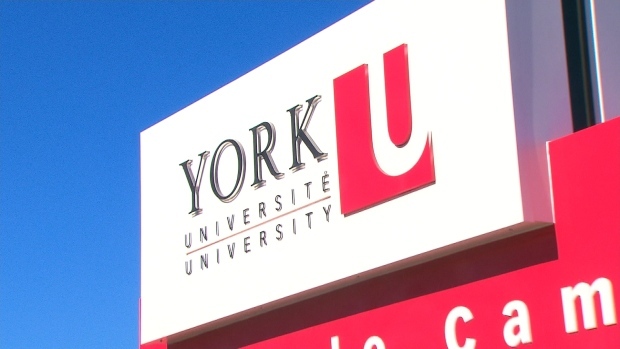 TORONTO -- Students at York University will head back to class this fall after Ontario's government passed legislation Wednesday ending a nearly five-month-long strike. An omnibus bill dubbed the Urgent Priorities Act contained key priorities for the newly-elected Progressive Conservatives, who called back the legislature for a rare summer sitting to deal with the issues. The bill contained back-to-work legislation to end the York strike, and was supported by the Tories but voted against by the NDP and Liberals. The labour dispute at the Toronto university saw 3,000 contract faculty and graduate teaching and research assistants walk off the job on March 5 over issues of wages and job security. "It's not about the union, it's not about the university, it's about the students," said Labour Minister Laurie Scott. "The strike has more than run its course. It's time to get these students back to class." Scott said it was clear in May that all parties had reached an impasse, and the bill's passage ensures the school and the union will now enter into binding interest arbitration. She said the strike is believed to have been the longest ever at a Canadian university. In a statement, Premier Doug Ford lauded the passage of his government's first bill and confirmed Ontario's legislature will meet for an additional two or three weeks this summer, continuing the rare summer sitting at Queen's Park. "During the election we promised to hit the ground running on delivering our plan for the people of Ontario -- a plan to deliver real change for Ontario taxpayers," Ford said. NDP Leader Andrea Horwath said the government's imposition of back-to-work legislation sends a bad message. "This initial move sends a signal that if the government's not happy with the process of negotiations, they're prepared to bring the big hammer of legislation forward. And that's never a good thing," she said. Horwath said the Ford government needs to address the underlying issues which led to the strike, including what she called the under-funding of post-secondary schools. "What the government needs to do is fund our universities properly. Instead they've trampled on the rights of these workers, and we'll see whether they end up going to court as a result of that." The Canadian Union of Public Employees, which represents the workers, said last week it would consider launching a legal challenge if back-to-work legislation was used to end the strike. In a statement Wednesday evening, York University's president and vice-chancellor said the school welcomed the move. "We believe in the collective bargaining process and share the view that back-to-work legislation is a last resort. Unfortunately ... we reluctantly had to conclude that the parties had reached an impasse in negotiations," Rhonda L. Lenton said. "We appreciate that Premier Ford and his government have made it possible to end the strike and allow our students to return to their studies. We look forward to welcoming our CUPE 3903 colleagues back." Meanwhile, the omnibus legislation also gives the government authority to approve executive compensation at the power utility Hydro One. It would require the Hydro One board of directors to establish a new compensation framework for the CEO and board, in consultation with the province and the partially privatized utility's five largest shareholders. The omnibus bill also cancels the White Pines wind project in Eastern Ontario, something the government promised last week when it laid out its key priorities for the session. The legislation also authorizes the government to pay WPD Canada, the company behind the White Pines project, compensation -- but it doesn't spell out how much. The company has suggested it could be over $100 million.